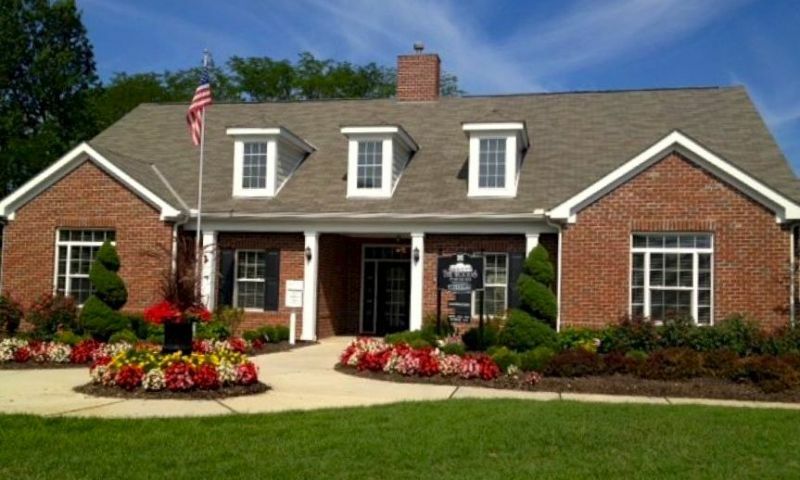 The Woods at Sugar Run is a charming active lifestyle community situated in New Albany, Ohio. Residents can choose from resale attached or single-family models that feature open floor plans with quality construction, Georgian-style architecture and elegant fixtures. With only 123 low-maintenance homes built by Epcon Communities, homebuyers can rest assured they are purchasing a quality-built home in New Albany. Homeowners can participate in activities and socialize with other neighbors at the community clubhouse. The clubhouse features an exercise room where residents can stay healthy and active by using the exercise equipment. Residents can also swim a few laps in the outdoor pool to stay in shape or just relax. Homeowners can take daily strolls along the neighborhood's walking and biking trails and enjoy the views of the wooded preserves and scenic ponds within the community. Construction of The Woods at Sugar Run began in 2008 to 2014 by Epcon Communities. At completion, there are 123 attached and single-family homes available on a resale-only basis. These homes feature private outdoor courtyards, spacious gourmet kitchens, plenty of closet space, large master suites, and Georgian-style exteriors. Some models feature an optional second-floor bonus suite that allows homeowners to expand their single-story living space. Homebuyers can choose from a variety of home designs, such as four attached floor plans and three single-family floor plans. The attached models range from 1,137 to 1,806 square feet and offer two bedrooms, two bathrooms, and an attached two-and-a-half-car garage. The single-family floor plans offer 1,519 to 1,995 square feet of living space. These detached models have two or three bedrooms, two or three bathrooms, and a spacious two-and-a-half-car garage. Residents at The Woods at Sugar Run can maintain an active and social lifestyle by participating in community events. Neighbors can gather at the clubhouse to plan or participate in a variety of activities, such as game nights, cookouts, brunches, workshops, seminars, holiday parties, and potlucks. Homeowners also have the luxury of having more time on their hands to do fun activities because they don t have to worry about the hassles of exterior home maintenance. The homeowners association dues cover trash removal, landscape maintenance, lawn mowing and fertilization, common area lighting, exterior building maintenance, street and driveway repair, and community pool and clubhouse maintenance. The Woods at Sugar Run is located near many great shopping, dining, and recreational options like Easton Town Center, Kroger, Wexner Community Park, and New Albany Country Club. Port Columbus International Airport is about 20 minutes away and residents have easy access to Interstate 270 and downtown Columbus, which is approximately 25 minutes away. Residents in The Woods at Sugar Run enjoy the convenience of low-maintenance living with plenty of nearby amenities in New Albany, Ohio. There are plenty of activities available in The Woods at Sugar Run. Here is a sample of some of the clubs, activities and classes offered here. These attached homes range in size from 1,137 to 1,806 square feet. They have two bedrooms, two bathrooms, and an attached two-and-a-half-car garage. These models feature a private courtyard, spacious master suites, and some models include a den. These single-family homes offer 1,519 to 1,995 square feet of living space. They have two or three bedrooms, two or three bathrooms, and an attached two-and-a-half-car garage. Some models include a den, and an optional second-floor bonus suite is also available for extra space. 55places.com is not affiliated with the developer(s) or homeowners association of The Woods at Sugar Run. The information you submit is distributed to a 55places.com Partner Agent, who is a licensed real estate agent. The information regarding The Woods at Sugar Run has not been verified or approved by the developer or homeowners association. Please verify all information prior to purchasing. 55places.com is not responsible for any errors regarding the information displayed on this website.